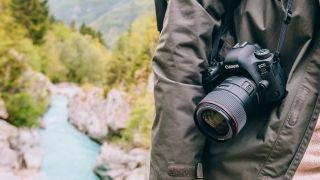 The enthusiast camera sector is arguably the most exciting of them all, filled with a raft of high-end compacts, mirrorless cameras and DSLRs designed for those who love to get their hands dirty when it comes to manual control. That said, they’re also extremely capable contenders when you want to concentrate on your subject and let the camera’s auto settings do the rest. Flexibility is further offered by the ability to swap the lens in use for many of the examples listed, and often compatibility with accessories such as flashguns. But which is the best enthusiast-level digital camera to suit your photographic needs? We’ve rounded up a selection of our recommendations to hopefully point you in the right direction. And Sony, please hurry up with the long-rumored new Sony A7000, as that sounds terrific! This is a solid, semi-pro DSLR that borrows a lot of the tech from the more senior D500, including its 20.9MP APS-C sensor. The camera's 3.2in LCD can be tilted up and down, and it also gives you the option of focusing on the subject by tapping it on the LCD screen, while the optical viewfinder provides 100% coverage of the scene. The D7500 also witnesses the arrival of 4K video to the D7000-series, and you can also capture Full HD footage at 60p for slow-motion playback, although only one slot for SD cards has been provided. Weather-proofed for the great outdoors, the camera's build quality feels good, with a monocoque carbon fiber composite body to keep weight down while remaining solid. Other notable features include 8fps continuous capture and a tried-and-tested 51-point AF system, which makes this a good option for sports photographers, while battery life is good for 950 shots. Together with excellent image noise performance and excellent dynamic range, you can’t go far wrong here. Like the feel and handling of a traditional SLR and want to step up from APS-C to full-frame photography? Then the second-generation, weather-resistant EOS 6D has got to be near top of your list, particularly with its headline feature being a new 26.2MP full-frame sensor and a sensitivity range that can be expanded to ISO 50-102,400 equivalents. We also get a latest-generation DIGIC 7 processor, but perhaps the most noticeable difference from the previous model on the outside is the 3in vari-angle display, which responds to touch. What's been left out, however, is 4K video, although there is a 4K time-lapse option that stitches together images into a 4K video, plus a microphone input to help you give audio capture a performance boost. AF performance is very good, and the camera handles a variety of lighting scenarios with ease, while battery life at 1,200 shots is likewise commendable. Overall, a solid workhorse of a DSLR. The G9 is a 20.3MP addition to Panasonic's impressive G-series line of mirrorless cameras, which looks and feels like a miniaturised DSLR, and can be used in conjunction with its maker’s wide range of Lumix G lenses. Being Panasonic, 4K video shooting is right up there on its spec list, though you’ll also want to look at its GH5 and newer GH5S if video is your specialism. An OLED electronic viewfinder delivers a life-like view for those preferring to shoot with the camera to their eye, while the construction shows its semi-pro mettle by being protected against dust, water and freezing temperatures. For studio or landscape photographers wanting that extra bit of resolution, an 80MP composite mode is also available, with images saved in the user's choice of JPEG or Raw formats. A new flagship model and the very first X-series mirrorless camera to be blessed with sensor-based image stabilisation, the X-H1 takes what we loved about the X-T2 and pushes it even further. While the camera is somewhat bulky – due in part to that stabilisation system – its design means it handles beautifully, particularly with larger and weightier optics. The menu system boasts the same clarity and ease of use as previous models, while the presence of Fujifilm's acclaimed X-Trans CMOS III sensor and X-Processing power give little room for concern with image quality. With AF refinements, better video specs and a super-handy top-plate LCD all sprinkled on top of the above, the X-H1 is a stellar X-series addition – and a worthy rival to the traditional enthusiast DSLR. With its backplate entirely taken up by a large touchscreen – as per your smartphone – the TL2 is appealing to mobile phone photographers who aren’t necessarily used to turning buttons and levers to take photographs, but nevertheless want to get a little more serious. Beautifully fashioned from a single block of aluminium, this is admittedly a camera for the wealthy, though it doesn’t quite feature the full range of features we might have hoped for given the asking price. That said, the unit is hand built, and images from its larger than average APS-C sensor are very impressive. We do miss the lack of a built-in EVF, though one is available as an optional extra and the life-like visuals via the 3.7in LCD means it does make up for it somewhat. A refined and tweaked version of one of our favourite retro-styled mirrorless cameras has always got to be worth investigation. Outwardly, it appears the camera has been on a dose of steroids, with its chunky, raised controls knobs and revised grip, while inwardly we’re now offered 4K video capture at up to 30fps, or otherwise Full HD footage at 60fps. There is also a new Advanced Photo mode that allows further fine-tuning of images, with Live Composite and Multiple Exposure options alongside. The Art Filter effects menu has also grown to number 15 settings, including a new Bleach Bypass effect, while continuous shooting speed has crept up by a fraction of a second, from 8.5fps to 8.6fps. With its compact body, masses of customisation options and a wide range of compatible Micro Four Thirds lenses to use with it, the OM-D E-M10 Mark III is a refreshing proposition for the mobile, image-conscious photographer. This APS-C-toting mirrorless model boasts precisely the understated design and luxurious build quality we’d expect from Leica. Although it requires a bit of familiarisation to get the best out of it, it’s capable of shooting 24MP images at up to 10fps, and features a bright and clear 2.36million-dot EVF. Existing Leica M- and R-system lenses are compatible with this model via an adapter, although a couple of dedicated lens kits pairing the body with either an 18mm or 18-56mm lens offer a degree of variety for first-time converts. Being a Leica, the asking price is reassuringly expensive, but then you are getting a handmade camera that offers a best-in-class performance and should last you years of usage. For those seeking a premium camera that does it all, the RX10 IV is a pricey but very capable solution. The focal range equivalent to 24-600mm in 35mm terms is the chief attraction here, as is the aperture range that's starts out at a bright f/2.4, while the larger-than-average 1in sensor provides excellent image and video quality. Given the lens's reach, built-in stabilisation is a must, and here it has a 4.5-stop effect. 4K video means it goes on to tick yet another box, while the presence of phase-detect AF means you can use it against moving subjects where other cameras of this kind would fall down. The rear display tilts and responds to touch, while the electronic viewfinder has a pleasingly sharp 2.35million-dot resolution. Logically laid out controls make for good handling, while the camera’s metering and white balance systems cope well in challenging lighting. Topping this off, a moisture- and dust-resistant build ensures that this is a camera you can take anywhere. The FZ2500, also known as the FZ2000 in some territories, is an enthusiast-level bridge camera option that acts as a rival to Sony’s RX10 IV, thanks to a well-rounded feature set that includes a 1in-type 20.1MP CMOS sensor. We also get a 35mm equivalent lens reach of 24-480mm, and, this being a Panasonic camera, 4K video capture at either 24fps or 30fps comes as standard too. You can pull 8MP still images from 4K footage and choose a different point of focus after you've capture using the Post Focus function, while the excellent electronic viewfinder is complemented by an LCD that can be swung outwards from the body. Needless to say, if it’s excellent image quality for both stills and video you’re seeking, you won’t be disappointed. An APS-C sensor and a zoom lens in a compact body – yep, you read that correctly! Pitched at its DSLR users who want a more pocket-friendly solution as a second camera, Canon’s most recent enthusiast compact at the time of writing manages to squeeze an APS-C sensor into a relatively compact chassis. This is married to a 24-72mm (equiv.) lens with an aperture range of f/2.8 to f/5.6, which is optimised to work with said sensor. In terms of handling, this will feel familiar to any of its manufacturer’s existing users, with a DSLR-like shutter release, a centrally positioned electronic viewfinder and a touchscreen LCD that can be extended and rotated to face a range of positions for added creative flexibility. Factor in resistance to dust and moisture and you can see why current DLSR users may want to add this to their kit bag.